It was a football weekend, wasn’t it? You were out a little too late, partied a little too hard, talked a little too much. When you finally crawled into bed at the crack of dawn, you could feel it. Right there. That little tickle in the back of your throat and the heaviness behind your eyes. The Common Cold. Of course, it could be anything. A cold, the flu, a stomachache, or God forbid – mononucleosis. While Advil, Kleenex and a warm blanket might make the chills subside and the sniffles stop, it’s common to feel even sicker while hung up in bed here on campus. Think about it: you’re far away from home and you have to take care of yourself. The first step is admitting you have an illness. I will be the first to admit that I will deny the fact that I’m sick. No matter how disgusting I look, I will deny it until I literally can’t get out of bed. To me, it feels like defeat, like I’m letting the illness win. Please don’t be me. Acknowledge that you’re feeling bad, remember that it’s okay, everyone gets sick once in awhile and go from there. The worst thing you can possibly do is pretend that your illness isn’t a big deal. It doesn’t matter what it is; if it makes you more comfortable, do it. Dressing up? Go for it. Sweatpants to class? Done deal. While some things can’t be avoided, the goal here is to get you to relax and get better. And to kick the homesickness? Wear a favorite sweatshirt from your hometown baseball team or put in those earrings that your mom bought you for your Sweet Sixteen. Going to class in those special possessions can almost make you feel as though you’re carrying a little piece of home with you, like a portable security blanket. Call your family. It sounds a little backwards, but it works. Sometimes just hearing a loved one’s voice can make us feel more at home. Try Skyping, calling, or, if you happen to lose your voice completely and it just hurts too much to talk, email family members asking them to leave comforting messages on your voicemail. Often simply knowing the people who miss you are thinking about you can make you feel a bit better. And trust me on this one: mothers are still mothers, even over the phone. 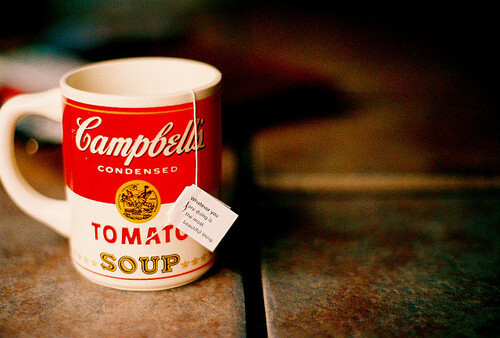 I am a strong believer that a good bowl of soup fixes almost anything, including homesickness. Get your favorite food from home (or attempt to make it), or just treat yourself to something comforting that you enjoy, whether it’s coffee, tea, hot cocoa, spaghetti, etc. It can work wonders for those waves of lonely feelings. It’s called “comfort food” for a reason. Don’t go overboard on the junk food, either. A body receiving healthy nutrition can fight off disease better–that’s just common knowledge. It’s easy to have a homesickness pity party while you’re sick ... it’s also easy to fall behind in class work. That’s something you’ll probably regret later in the semester. Plus, focusing on those notes or that upcoming exam will help channel any homesickness feelings you have into your work. Remember: you’re here for a purpose and you can accomplish it. Take frequent breaks and don’t completely push your nose to the grindstone; remember that keeping your eye on the prize might help put everything into perspective. Stressed and sick? Not a killer combination. The good news? The MU Student Health Center offers “Peace of Mind,” a weekly workshop about stress relief techniques and practices from licensed psychologists at no charge to students (it’s covered by your student health fee). Check it out: Thursdays from 4-5:15 pm at the Gaines/Oldham Black Culture Center Front Conference Room. It does. You’ll get better eventually with proper care and rest. And you’re at college, hopefully doing things that you love to do, pursuing a career in an area that you enjoy. Your family loves and cares about you and wants you to do well, whether it’s an actual biological family or just your friends. Being sick at college can remind us all that even though we may think we’re all grown-up, we can still miss the easy comforts of home once in awhile. And that’s totally normal; homesickness is a natural part of any college experience. But adding the sniffles and congestion into that equation can sometimes feel completely overwhelming. Keep in mind that those you love are only a phone call, Skype session, or a few hours away. And that’s probably the best medicine of all.